The heating media used is oil/ gas fired burner attached to heat exchanger. These are widely used in automotive industry besides various other industries. It is similar to Electrical belt Conveyor Oven but it has Oil/Gas fired heat exchanger as heating media instead of electrical heating elements. The total fuel consumption varies depending upon the size of working chamber & the working temperature. 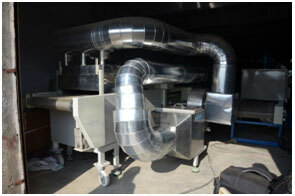 Saves running cost as compared to electrical conveyor oven. The air circulation is done with the help of dynamically balanced blowers to achieve uniform temperature throughout the inner chamber. Fully automatic imported burners are fitted on the heat exchanger for burning of Oil/ LPG. Heating Media: Diesel or LPG fired.